Good morning, this is my entry for the Cuttle Bug "Be Inspired" challenge this week! The challenge was to create a card w/matching gift/box! My set is a strawberry that was cut out with my cricut, the box was designed with Cricut Design Studio software & I used the dots cuddle bug folder for my card. I thought this would be a cute thank you gift set for someone special! I this is a `delicious` card and bag whoever recieves it will `love`it too Emma!!!! Very, very cute! I love this "sweet" set! Cute! Cute! cute!!! Just adorable bag and matching card. OMGosh Emma! So Cute! So glad to see you again at the Cuttlebug Challenge Birthday Palooza. So lovely Emma! Love the colors you used on the strawberrie! what a sweet set - love the glitter! thanks for playing along at cuttlebug challenge! Thanks for stopping by my blog! This strawberry is fabulous! I love it! 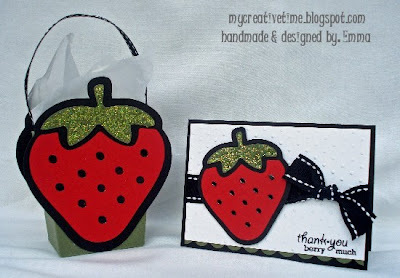 OMG look at that yummy strawberry this is such a sweet set Emma, love the color combo plus the design. so so so so so so so cute! Emma, your entry ni this Cuttlebug Challenge is just delicious! What a cute bag and card! Love the bright colors, the glitter, and the black and white for contrast. I love the contrast with the black shadowing. Oh this is a gorgeous bag and card! Just came across your blog, really love your work! Cute cute strawberries! I love how you did the over-sized strawberry on the bag.